Popular opinion would have you believing buckwheat is a healthy whole grain. And though you’d be correct about it being healthy, it’s actually a seed, not a grain. This seed is chocked full of protein, fibre and nutrients, and has helped prevent diabetes and ease digestive disorders. 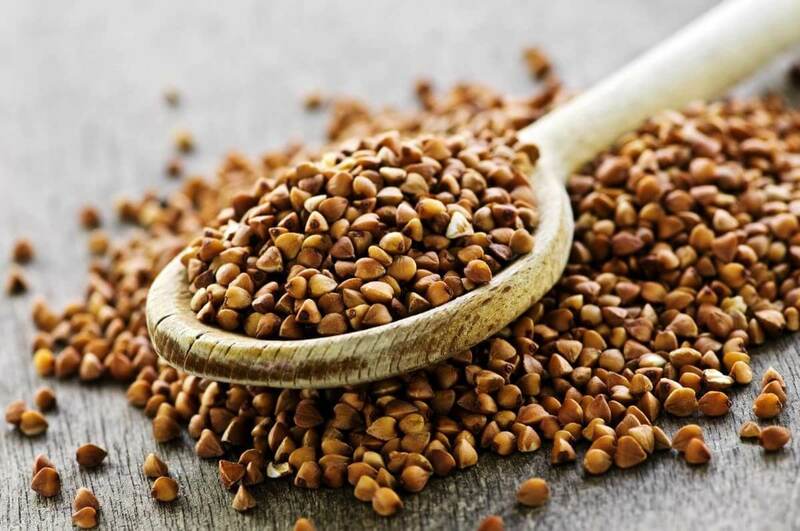 Buckwheat seeds, also known as ‘groats,’ are high in rutin, tannins and catechin, making them powerful antioxidants. Consider these guys the ultimate in superfoods! We love buckwheat as a staple food in place of rice, flour, pasta and any other mainstream starchy carbohydrate. 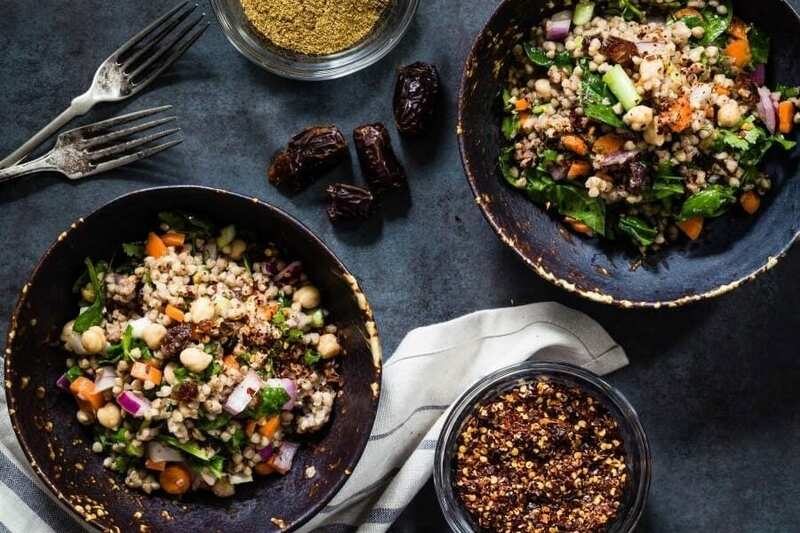 Since buckwheat is actually a fruit seed that is related to sorrel and rhubarb, it actually serves as the perfect grain-substitute for people who are sensitive to wheat or foods that contain protein glutens. Yes! It’s gluten-free! Without further ado, let’s get to the important part… How to cook with it. Buckwheat’s delicate, almost nutty flavour, make a hearty breakfast to say the least. 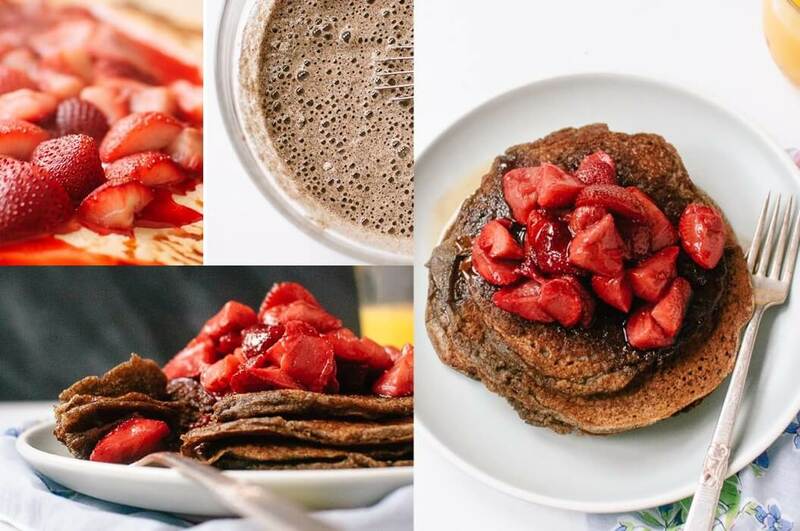 Thanks to the buckwheat flour, these pancakes possess a light and airy consistency that quietly surrenders to the pressure of a fork and soaks up maple syrup like a sponge. They go great with almond butter too. Recipe yields about 8 pancakes. Roast the strawberries: preheat oven to 350ºF (176ºC). Line a rimmed baking sheet with parchment paper. In a medium bowl, gently toss berries with the sugar and maple syrup/honey. Arrange the strawberries in a single layer on the baking sheet. Roast for 30 minutes, stirring halfway, or long enough for the berry juices to thicken but not burn (watch the edges in particular). Make the pancakes: in a medium mixing bowl, mix together the flour(s), sugar, baking powder, baking soda and salt. In a liquid measuring cup, measure out the buttermilk. Beat in the egg and vanilla extract. All at once, add the wet ingredients to the dry ingredients and mix until just combined. The batter should have some small to medium lumps. Preheat your skillet over medium-low heat and brush with 1 ½ teaspoons of butter. Give the batter a light swirl with a spoon in case the buckwheat is starting to separate from the liquid. Using a ¼-cup measure, scoop the batter onto the warm skillet. Cook for 2 to 3 minutes until small bubbles form on the surface of the pancakes (you’ll know it’s ready to flip when about 1 inch of the perimeter is matte instead of glossy), and flip. Cook on the opposite sides for 1 to 2 minutes, or until golden brown. Choose dairy free with your own homemade buttermilk option: combine 1 ¼ cups low fat milk (any variety of low fat milk should do—almond, soy, rice, low fat coconut) with 1 tablespoon + ¾ teaspoon lemon juice or vinegar and let it sit for 5 minutes before using. Buckwheat is completely transformed by soaking overnight and then by infusing delicious flavour at every stage of cooking. I think you’ll love this healthy take on a classic dish. Place buckwheat in a large bowl and cover with cold water. Leave to soak overnight or for at least 8 hours. Drain and rinse very well under running water until no longer gluggy. Set aside. Preheat the oven to 200°C (392ºF). Place the cauliflower in an ovenproof dish. Toss well with oil and roast for approximately 35 minutes until tender and the tips are browned. Season generously with salt. Meanwhile, heat 3 tablespoons of oil in a sauté pan over a medium heat. Add the garlic and the leek and cook gently without browning until translucent and soft. Add the tarragon, white wine, buckwheat, lemon zest, bay leaf and roughly half the stock. Reduce the heat slightly and cook until the liquid is almost entirely all absorbed, stirring often. Remove the bay leaf after 15 minutes. Continue to add the stock in half cup increments and stir very regularly. This will take approximately 45 minutes total. 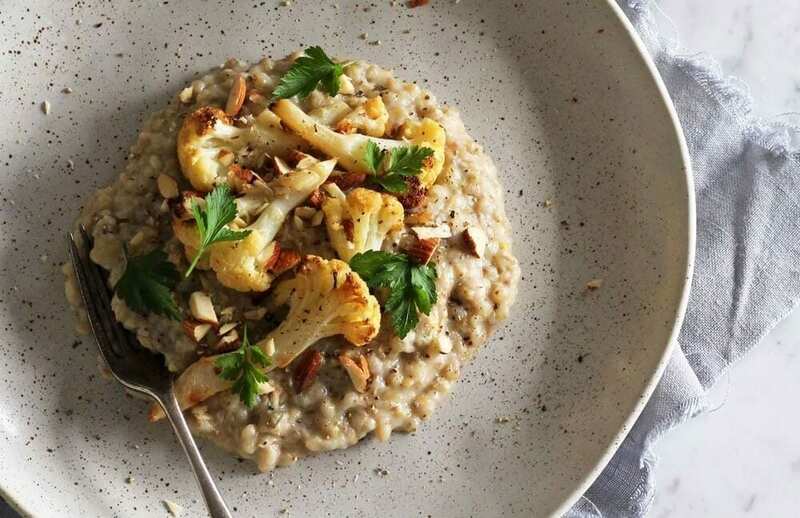 The risotto is finished when the buckwheat is tender and the texture is creamy and not too soupy. Stir through the parmesan and season to taste with salt and pepper. Divide the risotto between four bowls. Top with the roasted cauliflower, a generous sprinkling of almonds and fresh parsley leaves. Serve immediately. By adding cumin to the dressing, as well as using dates and chickpeas was enough to give the salad that authentic Moroccan flavour that is so sought-after. It’s surprisingly simple, and very more-ish. If you’re opposed to dates, as many people are, simply skip that step out entirely to create the perfect salad made especially for you. Cook buckwheat according to package instructions and let it cool completely. In a large mixing bowl add the salad ingredients together with the buckwheat and set aside. In a glass jar mix the dressing ingredients and pour over the veggies. Combine and serve immediately. 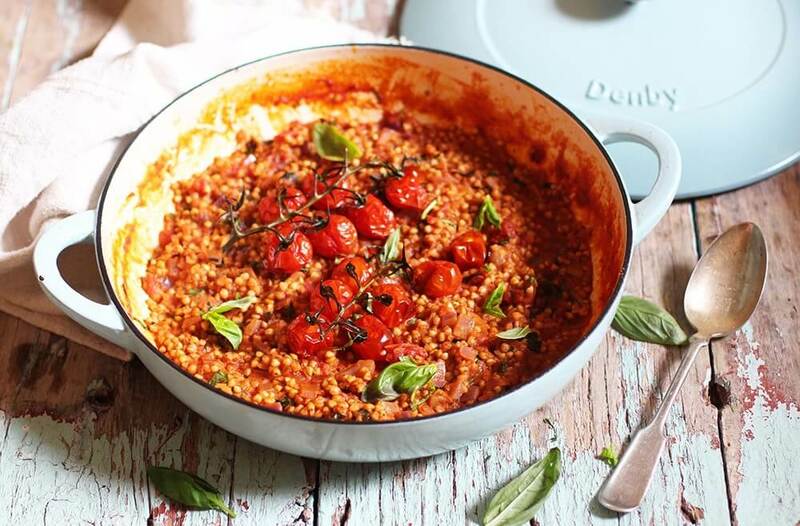 Oozing comfort, yet lovely and bright with the summery flavours of roast tomatoes and fresh basil. The texture of buckwheat when it’s cooked like this, is somewhere between risotto and orzo but it’s higher in protein and fibre than both. Preheat the oven to 200ºC (392ºF). Place the cherry tomatoes on a roasting tray and drizzle them with a little olive oil. Season with sea salt and pepper and pop them in to roast for about 20 minutes. Cook your risotto until your desired wetness and serve hot with a sprinkling of fresh basil on top and some parmesan if desired.